On this self-guided walking holiday explore the Austria's picturesque Lake District. Walk from the unspoiled Lake Schwarzensee to Lake Attersee - Austria's largest Lake. Hike among Alpine pastures, high plateaux and summit some of the region's most spectacular peaks. Mouth watering food and drink - From Apple strudel to Zirbenschnaps -made from pine cones. The holiday starts in the charming village and ancient resort of Bad Ischl. On arrival you can take a wander through the streets of this Spa town, do a little shopping or enjoy a coffee and apple strudel in one of the many cafes. Today's walk starts from your hotel in Bad Ischl; walk past the church and along the Ischl River. Cross the forest on the beautiful Elisabeth Forest Trail. Ascend to Lake Schwarzensee (715m). In the summer, when the sun has warmed up the water, you may wish to take a dip in the clear waters. You reach the town of Moosbach, where you can stop for refreshments at one of the charming cafes. From here there is a steep ascent of the gorge, then descending to Attersee Lake. Walk along the shore to Unterach where you spend the night. Today's 21.5km walk is expected to take between 7 hours and you will ascend 450m and descend 410m. There is the option to shorten the walk by 7km if you take the bus part of the way. Today starts with a climb in the shadow of the Schafberg (1783m), start by following a series of hair pin bends which continue to cross mountain pastures up to the Buchberghütte refuge where you can refuel on some regional food and drinks. The path continues towards Scharfling, and then descends to the Krottensee Lake, where you can take a refreshing dip in the water. From here you hike towards the shores of the Wolfgangsee Lake, then up to the town of Abersee where you spend the night. Today's 14km walk is expected to take about 6 hours and you will ascend 650m and descend 550m. There is the option to shorten the walk by taking a bus part of the way. You can spend the day soaking up the atmosphere and beautiful surroundings of Wolfgangsee Lake, one of the best known in the Salzkammergut region, with an easy short 4km lakeside walk to Strobl. Those wanting it easier can take a ferry! For those keen to stretch their legs there is the option to walk to the Postalm Alpine Pasture, the largest in Austria and one of the highest in Europe. The Wolfgangsee stretches 10km and is surrounded by the Salzkammergut mountain range. You could take the cable car to the top of Schafberg where you can admire the panoramic views before walking to Strobl. For the energetic, you can hike up between the summits of Sparber (1502m) and of Bleckwand (1541m) to the Postalm Alpine Pasture. You may have the chance to catch a glimpse of a red or a roe deer that make their home here. Here you can stop off in one of the shepherds' huts to taste milk, cheese and bacon. Next descend back to Strobl along the Weissenbach stream where you spend the night. Today's walk is 4 kms with an addition optional 14km walk, and is expected to take about 1 hour and 6 hours respectively, you will ascend 950m and descend 250m. There is the option to shorten the walk by returning by bus from the pastures. Starting from Strobl, it's not long before you find a path called the Bear Track. This is an old path leading to a pass at 1333m. There is a great panorama from here and also an optional ascent to the top of a nearby peak (1414m). This is not a well-trodden route and has very steep drops making it unsuitable for vertigo sufferers. You then descend the wide valleys and walk towards Hallstättersee Lake following streams and gorges to the attractive market town of Bad Goisern where you spend the night. The wooden village with flowered window boxes, on the lake shore, framed by the mountains makes it one of the most picturesque in the region. Today's 19km walk is expected to take about 8 hours and you will ascend 840m and descend 970m. There is the option to shorten the walk by taking a bus or train part of the way. Hike towards Hallstatt on the E4 route, one of a network of 11 long distance paths across Europe offering marvelous views of the remarkable village of Hallstatt, jewel of the Salzkammergut region. Take the time to explore Hallstatt with its 16th century Alpine houses and alleyways, home to cafes and shops, before beginning your walk. You follow the lake banks and walk through the narrow valley of Koppental, up to Bad Aussee on the confluence of three rivers. Today's 25km walk is expected to take about 7 hours and you will ascend 445m and descend 425m. There is the option to shorten the walk by taking the bus part way. Your final day walking takes you to the spa town of Altaussee nestled on the shores of a lake. From here you start climbing up to the Blaa Alm pasture. Then, you follow the Rettenbach gorges then a good forest track leads you back to Bad Ischl where you spend the night. Today's 20km walk is expected to take about 7 hours and you will ascend 700m and descend 600m. 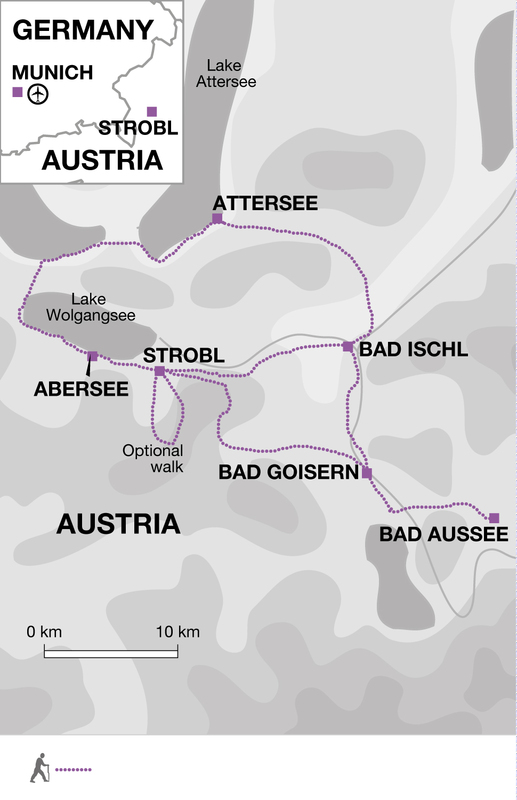 There is the option to shorten the walk by taking the morning bus from Bad Aussee to Altaussee. Take light and comfortable clothing that can be layered according to the temperature. July and August are the hottest months whilst early and late in the season go prepared with clothing to suit drops in temperature and possible showers. Light rainwear may be needed at any time of year, and a warm fleece/jacket is recommended for cooler evenings and nights. Walking boots or shoes and comfortable trainers and/or sandals for sightseeing and relaxing. Bring one main piece of baggage as per your airline luggage allowance, maximum 20 kg per person. Remember you are expected to carry your own luggage if using public transport so don't overload yourself. Luggage transfers between hotels are normally arranged by the hoteliers. Please note luggage transfers are restricted to 15 kg per person, any additional weight will need to be packed in your day bag. Mark your bags clearly and leave them at the place and time arranged with them. When travelling on public transport you should always take your luggage with you. Insect repellent, sunglasses, walking poles, sunscreen and a water bottle are all recommended. Maps - Along with the destination manual and route notes you will be sent a map which has the route marked on it. There are no local fees for this holiday. For this trip you can fly into and back from Salzburg or Linz airports. At the start of your trip you can fly into Salzburg or Linz airports. On this journey you walk 113.5km over 6 days (an average of 19km a day) with an optional 14km day. There are long walking routes of 6 to 8 hours, some with tough ascents or descents, with a maximum ascent of 950m on one day. There are options to shorten the routes by using local buses. We have graded this trip as moderate to challenging. Fri 10 May 2019 - Sun 30 Jun 2019 Your trip can depart anytime between the above dates. Contact us for triple room requests and solo traveller prices. Mon 1 Jul 2019 - Sun 1 Sep 2019 Your trip can depart anytime between the above dates. Contact us for triple room requests and solo traveller prices. Mon 2 Sep 2019 - Fri 4 Oct 2019 Your trip can depart anytime between the above dates. Contact us for triple room requests and solo traveller prices. Sun 10 May 2020 - Tue 30 Jun 2020 Your trip can depart anytime between the above dates. Contact us for triple room requests and solo traveller prices. Wed 1 Jul 2020 - Tue 1 Sep 2020 Your trip can depart anytime between the above dates. Contact us for triple room requests and solo traveller prices. Wed 2 Sep 2020 - Sun 4 Oct 2020 Your trip can depart anytime between the above dates. Contact us for triple room requests and solo traveller prices.